South African startup Simply Financial Services is looking to shake up the country’s mass-market life insurance space by serving as many people as possible. 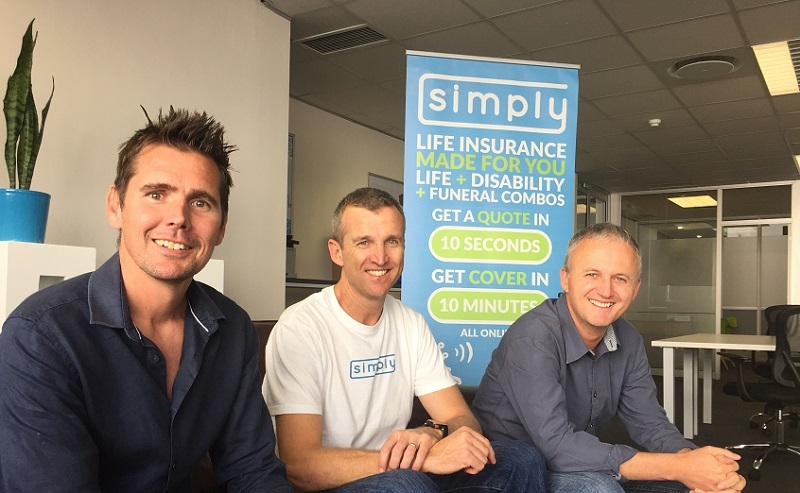 The Cape Town-based Simply, launched in November of last year by technology entrepreneur Anthony Miller and actuaries Simon Nicholson and Shaun Dippnall, defines the mass-market space as people earning up to ZAR30,000 (US$2,300) per month. An extremely competitive arena with high lapse rates and aggressive marketing, Simply is looking to gain as big a customer base as possible by using its online platform and call centre to sell insurance family cover directly to individual breadwinners, domestic cover via domestic employers, and business cover via SME employers. Recognising that most adult South Africans do not have life or disability cover, Simply sells life, disability and funeral combos that provide what Miller calls “a good mix of cover at a great price”. Miller said he and his co-founders were encouraged to launch Simply by the huge size of the life insurance market in South Africa, where approximately ZAR10 billion (US$760 million) in new annual premiums are written annually. “Around 70 per cent of that business is in the small policy – mass – market, which includes funeral, credit life, life and disability policies providing lump sum cover,” he said. Simply sees a “dire need” for easily understandable, affordable life insurance products in South Africa. “We believe we can use our combined experience – tech startups, life insurance business building across geographies, human-centred design – and strong industry networks to build a business that can cut through the noise and deliver super simple life insurance products at disruptively low prices,” said Miller. So far, it seems to be working. Nearly 2,800 policies have been bought to date via Simply, which has a current run rate of over 600 policies per month. ZAR1.4 billion (US$106 million) in cover has been bought to date, with 50 per cent of online sales taking place via mobile devices. “As a result of our respective track records and industry relationships we’ve been able to raise venture capital funding from Lomhold – the backers of BrightRock – and two private investors whom we know well,” Miller said. The startup earns income from three key sources. It operates a cell captive structure, meaning it owns preference shares in OMART and participates in the profits and losses arising within this cell. It also earns commissions for distributing and selling policies, as well as binder fees from the cell in respect of administrative functions performed on behalf of the cell, such as issuing policy documents, facilitating premium collection, and administering claims. “These sources of income all depend on the cell running profitably in the long run. If the cell runs at a loss it can’t afford to pay commissions or binder fees. As such, Simply is in many ways exposed to the same revenue and profit drivers as an ordinary life insurer,” Miller said. He said, despite some challenges, the team was happy with progress to date. “We feel we’re on track to achieve our business goals and make a meaningful difference in the South African mass market. We feel good about the products. We think they offer great value and we have great confidence in OMART as the underwriter,” he said. However, Miller believes Simply’s products and technologies are very portable. “As soon as we have the South African business bedded down, we’ll commit some resources to exploring other markets. We think the structure of our business and our relationships with Old Mutual Alternative Risk Transfer and the Reinsurance Group of America set us up really well to enter new markets. Early candidates include Mauritius and Kenya,” he said.